Pandering to the pro-Israel lobby was the order of the day for candidates of both parties. AIPAC has a problem. The pro-Israel group, known by its acronym, which stands for the American Israel Public Affairs Committee, has over the past several decades been one of Washington’s most influential foreign policy lobbies. But a bruising fight with a Democratic president over the past few years left AIPAC licking its wounds. Where once many of Capitol Hill’s Democrats could be expected to march in lockstep with AIPAC, the Iran nuclear deal led to a fissure: Most Democrats, save for a few of the Hill’s unreconstructed pro-Israel hawks, were torn over whether to side with Barack Obama and his Iran nuclear deal, or AIPAC and Israel’s right-wing government, led by Prime Minister Benjamin Netanyahu, which opposed the deal vociferously. In the end, Obama prevailed by marshaling Democrats in defense of the deal. Netanyahu had unambiguously sided with Republicans who opposed the accord, leaving the appearance that AIPAC was doing the same. It was fitting, then, that AIPAC would gather its members in Washington’s Verizon Center over the weekend under a banner of bipartisanship, with the declared theme of the summit—”Come Together”—hailing a reconstitution of the group’s bipartisan appeal. The appeal to Lennon-McCartney was obvious: time to bury the hatchet and move on. Come Together was a strange slogan for a summit where Donald Trump got raucous applause. And so it was that invitations went out to all the presidential candidates from both parties; all accepted—Ted Cruz, John Kasich, Donald Trump and Hillary Clinton—but not Bernie Sanders, the Vermont socialist running for the Democratic nomination. Sanders sent a letter to AIPAC, released on his website, in which he said AIPAC declined to have him address the crowd by video while he campaigned (a courtesy they had extended to Newt Gingrich and Mitt Romney during the 2012 Republican primary contest). Sanders ended up releasing the text of an address he delivered in Utah. “Let me begin that I have a deep personal connection to Israel,” he opened, “and I am fairly certain I am the only U.S. presidential candidate to have ever lived on a kibbutz for a while.” It’s a shame the AIPAC crowd didn’t hear it: Sanders is the only candidate who offered any sort of vision to beat back the tide of apartheid in Israel. The bromides about defending Israel’s legitimacy were there, but so, too, were the criticisms of Israel’s violent occupation and its destructive settlements expansion. Come Together was a strange slogan for a summit where Donald Trump got raucous applause. This is a man whose campaign is based on demagoguery and divisiveness, some of it directed at Latin American immigrants and some of it against Muslims (though AIPAC has already shown it cares little for the latter). 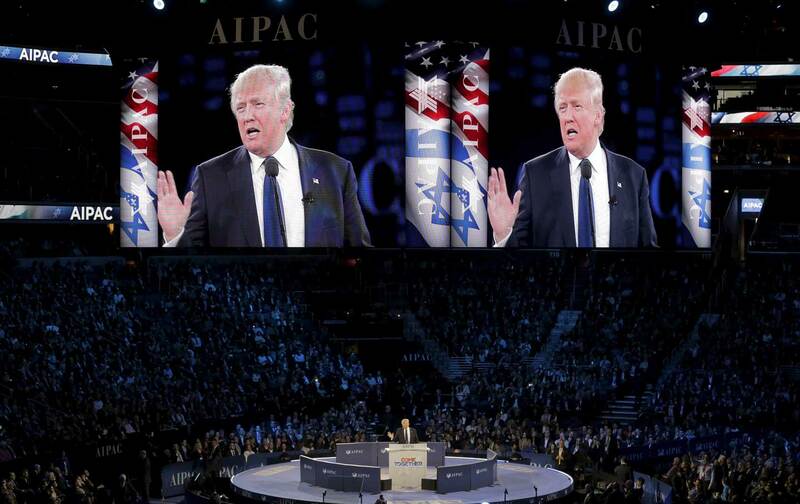 Should AIPAC have denied Trump an invitation? I’ll leave that for others to decide, but will note that the group has previously declined to host presidential candidates it deemed beyond the pale: In 2012, the group shunned GOP candidate Ron Paul, who opposed aid to Israel, which apparently is a greater crime than heading up American history’s most successful quasi-fascist movement. More troubling still, the candidate promulgating a fascist-like ideology was well-received. At Rolling Stone, Sarah Posner reported that the appreciative reception for Trump drowned out two non-disruptive protests—some rabbis walked out of Trump’s speech and a group of some 200 young people protested outside the arena. Trump’s biggest crowd-pleasers came mostly along the same lines Netanyahu has laid out over his years as Israel’s prime minister: glowing praise for Israeli democracy (with no mention of Palestinians’ subjugation), attacks on the United Nations, denunciations of “rampant incitement” and an unwillingness to negotiate from the Palestinians. There were many standing ovations. The hostility toward Obama, however, was in part AIPAC’s own doing. AIPAC’s obvious tensions with Obama erupted in tandem with Netanyahu’s anger at the president’s proposal to halt Israeli settlements in 2009. Things deteriorated sharply from there when diplomacy with Iran blossomed. AIPAC spent years pushing the line that the deal Obama was working to strike—and eventually did—was dangerous for Israel. The logic seems to go: This man is grievously harming your beloved Jewish state, but let’s not criticize him. For all the many problems with Trump, his attacks were less ad hominem than in keeping with what many AIPAC members surely believe: that Obama “may be the worst thing that ever happened to Israel,” as Trump put it. Then there was the other leading presidential candidate, this one from among the Democrats. Hillary Clinton has made a point throughout the campaign of continuity between herself and Obama. But on foreign policy, she has consistently been more hawkish than the incumbent president. That was apparent at AIPAC, where she eschewed hard truths in favor of shameless pandering, taking subtle jabs at Obama’s Middle East policies. She defended the Iran nuke deal, but talked tough against Iran; mentioned the Israeli-Palestinian conflict, but placed no blame on the Israelis (save a grammatically oblique reference to settlements that failed to finger the culprits); and attacked as anti-Semitic the movement to Boycott, Divest and Sanction (BDS) Israel. None of this should have come as a surprise: Clinton has been willing to use GOP talking points to attack her Democratic rivals for not being tough enough on Iran; she made the point of telling her biggest donor, Haim Saban, who has himself flirted with anti-Muslim bias, that she would help lead the fight against BDS; and, despite her past condemnations of Netanyahu and his pro-settlement policies, she long since made clear that she would like to mend fences with the right-winger. The occupation will go on, with neither American party's leadership willing to do anything to stop it. The two leading presidential candidates of both parties, then, have struck the same tone, with small differences. One thinks the Iran deal was good, but that Iran must be bludgeoned into subservience. The other opposes the Iran deal, and believes that Iran must be bludgeoned into subservience. Both oppose action at the United Nations against Israel’s decades-long occupation of the Palestinians. Neither is daring enough to mention Netanyahu’s culpability in killing the two-state solution through rapacious settlement expansion, nor his anti-Palestinian bigotry. If either of the two front-runners succeed in their quest for the White House, Obama’s fortitude in standing up to Israel—if only at the margins on most issues, but on central ones like the Iran deal as well—will become a thing of the past. The occupation will go on, with neither American party’s leadership willing to do anything to stop it. They will invite the dreaded one-state solution—not the pie-in-the-sky democratic state version but apartheid. In this twisted way, maybe “Come Together” is an appropriate theme after all.